Xiaomi is Chinese OEM that impresses possible customers with powerful yet affordable smartphones. 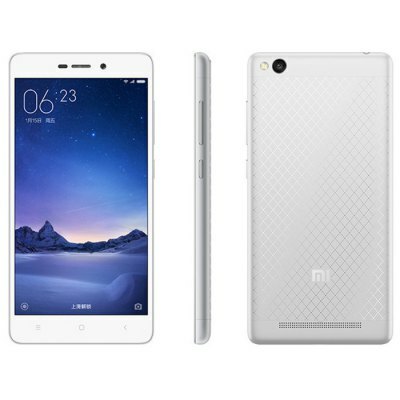 The latest addition to the company’s lineup of this kind of smartphones is the Xiaomi Redmi 3, which first catches the eye thanks to its unique design and then awes with its powerful specs and low price. The smartphone is available for presell until February 10 for only $159.99 on Everbuying. For this price, customers can get a great looking smartphone with a lot going on under the hood, including a huge, 4100mAh battery that will make them forget about worrying that they will run out of power exactly when they need their smartphone the most. The Xiaomi Redmi 3 has a beautiful design with a full metal diamond-patterned frame and an almost edge-to-edge display. The rounded edges of the device make it look more modern and elegant, and the carefully placed controls of the smartphone only add to its beauty. The 5-inch display offers a 1280 x 720 pixels resolution which ensures the good quality of the delivered images. The screen of theRedmi 3 will display clear and sharp images, so it is perfect for watching videos and playing games. The smartphone runs on Android 5.1 Lollipop, so users will be able to download all their favorite content, games and apps from the Google Play Store. Xiaomi is also planning on releasing the Android Marshmallow update to several new models, so if you purchase the Redmi 3 you might get the software update soon. The device is powered by a Snapdragon 616 octa-core processor clocked at 1.5GHz, which is combined with the Adreno 405 GPU in order to make the smartphone more efficient and fast. It includes 2GB of RAM and 16GB internal storage, which can be extended by up to 128GB thanks to the second SIM card slot of the smartphone which can also be used as a TF card slot to add some extra storage. Due to this feature users will never have to worry about not having enough storage to take their music, videos and games with them everywhere. The 4100mAh battery of the smartphone makes it possible for users to enjoy these contents for a longer period because the smartphone won’t run out of juice easily. The Xiaomi Redmi 3 has an impressive 13MP back snapper and a 5MP front-facing camera with autofocus, flashlight, and touch focus. The camera functions include HDR, panorama mode, face detection, and they can record good quality video. The f/2.0 aperture of the smartphone’s camera makes it possible for users to capture great images even in low-light conditions, so they won’t have to miss out on anything, and they will be able to capture all their memories with their Redmi 3. Whether they would like to shoot photos or videos, the quality of the resulting content will be more than satisfying. Other features of the Redmi 3 include gravity sensor, ambient light sensor, proximity sensor, E-compass, WiFi, Bluetooth, and GPS connectivity. Sharing content with other people, surfing the web and downloading content from the internet has never been easier or more comfortable. 4G smartphone really impresses with its looks and specs, so the $159.99 price for which you can purchase the smartphone on Everbuying is quite low. Those who choose to buy the Remi 3 should take into consideration the fact that the device will only ship after February 10, but even so, they should order the Xiaomi smartphone as soon as possible to make sure they will get their hands on this beautiful smartphone as soon as it will start shipping. Beats Pill+, the right speaker for you?